Ah, the Olympics are back! Our nation’s athletes will be competing for Olympic gold and in doing so, they will bring about a fresh new round of fads that will generate many questions from patients. I’ve only been in the clinic for about three hours, and have already received numerous questions about Michael Phelps, the new poster boy for an ancient medical treatment of cupping. 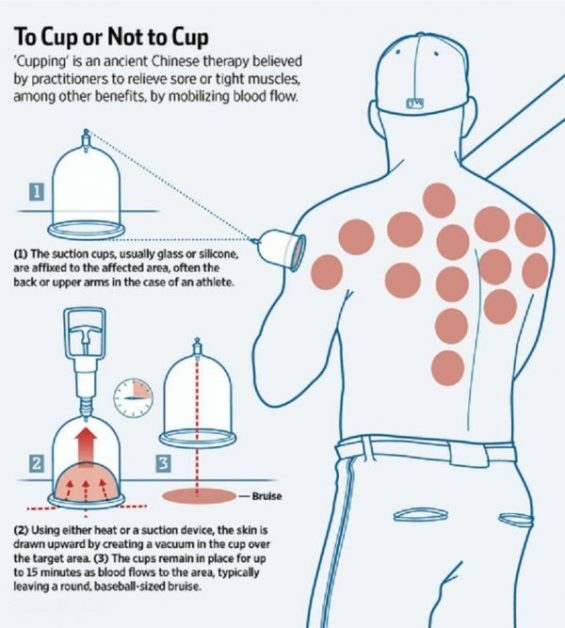 What is cupping and how does it work? Those are great questions! First, cupping is not a new treatment technique. Cupping has been around since early Egyptian and Chinese times, approximately 1550 BC. The technique of cupping is that heated glass cups are applied to the skin along the meridians of the body, creating suction as a way of stimulating the flow of energy. The expansion of blood vessels brings more blood to the area it is applied and hopefully will stimulate healing. There are generally two types of cupping, dry and wet. Dry cupping creates vacuum at the surface of the skin using glass or plastic cups that leave a bruise. What cupping involves making small incisions and letting out a small amount of blood to the area being treated. The cups are then left for anywhere from 5 to 15 minutes. The bruises typically heal within 3 days and it is though the area under the skin will also heal. But here’s the million-dollar question, does it actually work? It is hard to create a double-blind study for this type of procedure as it is very evident that the patient has or has not treatment given the marks on the skin. Therefore, a placebo is very hard to be use as a control. An systemic review of 14 articles related to the use of cupping performed by Cho et al in 2014 found that only one of the 14 articles suggested that cupping was minimally effective in treating low back pain. Most found that if anything relief was found form of the placebo effect. (Cho et al. Adverse events related to cupping therapy in studies conducted in Korea: A systematic review. European Journal of Integrative Medicine Volume 6, Issue 4, August 2014, Pages 434–440). While more blood is brought to the are in question, the target tissue is much deeper in the body while the tissue affected, (the skin), is very superficial. What are the risks? Bruising is created by broken blood vessels and blood pooling within the skin. Stagnant blood may actually slow healing and damage the surround tissue as oxygenated blood cannot get to the tissue and possible create an abscess. Bottom line? Cupping does not appear to provide any benefit in treating pain or restoring tissue health. The risks are fairly low in trying this technique if you are willing to look like you got into a losing battle with a vacuum cleaner for a few days.